Joy Guildford is an American Psychologist who in 1958 planted the seed toward the study of Creativity. In a speech to the American Psychological Association, and in reference to the recent launch of the Soviet Satellite Sputnik, he challenged his peers to start thinking about what makes people creative. Guildford believed that individuals should show their intelligence by being inventive in some way, and not merely on their ability to memorizing facts and figures. As we look to cultivate creativity in our children, we must take this advice and provide opportunities for our little ones to be inventive. If you take time to observe your child, you’ll quickly notice how often they apply creative thinking in order to solve everyday problems that manifest in their lives. From fixing toys, or discovering how to reach for the Cookie Jar; to coming up with excuses to delay bedtime, or offering reasons why they shouldn’t take a bath –our children are highly inventive within their world. As parents we must make an effort to recognize when our child is being inventive, and within our home, celebrating it equally to the development of new vocabulary or learning to subtract. As they begin to get older, we must then actively seek out opportunities that challenge them to apply this type of thinking to the real world. Whatever their interests, they should be challenged to, and praised when, they invent something new and useful. My eldest using items we put in an invention box to make a house on wheels for his toy worm. Unfortunately, this type of thinking is squandered, or in some cases made dormant in educational environments that measure progress on what knowledge has been committed to memory, as opposed to how well that knowledge is applied to a real-world problem. As parents we can partner in education, by recognizing and celebrating the ways our child likes to invent. For example, my eldest likes to ‘invent’ stories – so we make a point to sit down and let him read his book to us. Simple additions to our home such as an ‘Invention Box’ can help encourage our children to be inventive. Invention boxes can build up over time, and include things like broken toys, boxes, string, and even old power cables, or discarded electrical devices. With some facilitation from the parent, children can be challenged to invent products that solve real-world problems, and as their knowledge for the real world increase, so will their solutions. 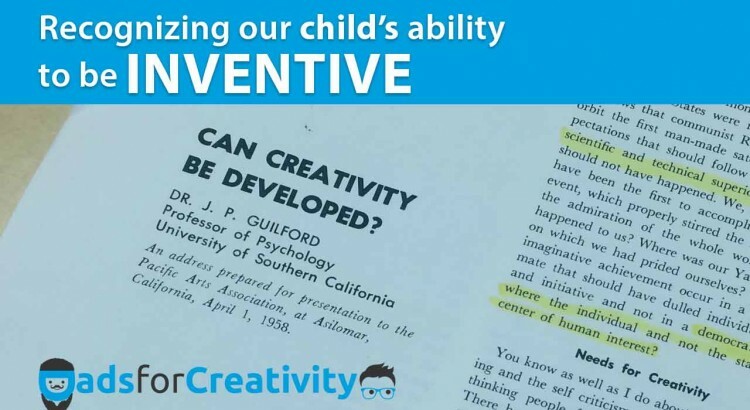 As parents we shouldn’t feel the need to master in-depth studies in creativity in order to cultivate creative thinking skills in our children. We simply need to first recognize our child’s ability to INVENT, and then find ways to encourage this further, by knowing what our child likes to invent and then making opportunities for it to happen.